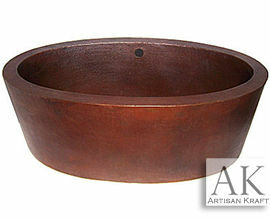 Shop many more freestanding copper tub styles available call about details. Finely hand-crafted clawfoot copper bathtubs. Available in various slipper shapes, sizes & styles. Copper bathtubs are sure to bring an extra-ordinary feel to your bathroom space decor. We have more styles call & we will email you photos. Planning to buy a beautiful + elegant copper bathtub? Artisan Kraft is the right place for you! We are one of the leading suppliers of premium quality clawfoot copper bathtubs & sinks. We’ve long provided you with the finest fireplace mantels and stone bathtubs. 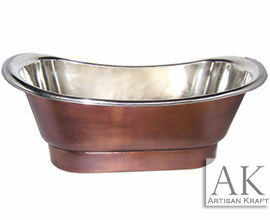 Now shop our collection of copper bath tubs. It goes without saying that bathrooms are really unacknowledged heroes of our homes. Give your bathroom that much-desired unique look & feel by making a soaking copper bathtub a part it. Browse through our extensive range of creatively crafted copper bathtubs and buy one today! Our exclusive + remarkably designed freestanding copper bathtubs offer an unparalleled bathing experience. They have an alluring appeal a normal bathtub can’t offer. Our bathtubs look classy. They also have some really impressive qualities like durability, easy-to-clean, low on maintenance & high-quality natural material, that means they will look new and shiny for the years to come! They have a great bronze look. Not only does this look classy, it also has some really impressive qualities like durability, easy-to-clean, low on maintenance & high quality natural material. Why should you buy copper bathtubs? Copper bathtubs maintain temperature & do not require regular reheating. This is a great saving. Copper has anti-bacterial properties & is known to prevent bacteria growth. It is an environment-friendly metal as it is recyclable. Copper has various health benefits. It is one of the essential minerals required by the human body. Soaking and bathing in a copper tub can help in the formation of collagen which can lead to increase in the absorption of iron. Available in various shapes, sizes, designs, + styles. Our copper bathtubs are sure to bring an extraordinary look + feel to your existing bathroom space decor. We guarantee that all the clawfoot copper bathtubs sold by us are made from premium quality copper. They are highly durable + have great longevity. Find out the benefits of copper kitchen farmhouse sinks here. All the copper bathtubs offered by us are one-of-a-kind. You can customized one all our products. We can design it and make it for you! Our prices are very affordable. Browse through our extensive range of creatively crafted freestanding copper bathtubs & buy one today! Get a free quote for custom copper bathtubs by sending us your preferred design with dimensions & model details and we will reach you soon. We also have a huge selection of marble bathtubs. 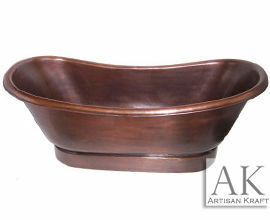 Give your bathroom that much desired rustic look & finish by making copper bathtub a part it. Feel free to write us at info@artisankraftfireplaces.com or call us at 8886520106.